Imagine that you are a top manager who was a sign of the task of measuring productivity of certain company. What is measurement of productivity, and what does it have in common with measurement of performance? What should you start with? What is the right way to select indicators which will signal about success of failures of the business? Moreover, evaluation of business productivity should be communicated with strategic goals. Making profits is not enough to call business productive. Of course, there are no universal answers to these questions. Every company is individual and thus requires individual approaches to evaluation of performance and productivity. However, use of effective and well reputed performance management system is a must. If you should communicate strategy with operational management and Balanced Scorecard is exactly what you need. 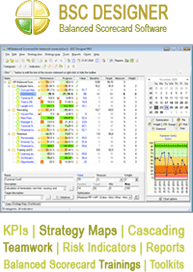 On the one hand, you can use balanced scorecard as a performance management tool. Balanced scorecard evaluates key performance indicators in four categories: financial, customer, internal processes, learning and growth. Each category has a number of indicators which characterize key success factors in a certain business area or direction. As a result, you will have performance management evaluation index expressed in figures or percents. But what is more important you will have figures measuring all key success factors. Thus, it will be possible to locate week points in the work of the company. But if your task is to communicate operational in strategic management, or in other words, puts strategy into action, and at the same time evaluate current performance of the company, balanced scorecard it just an ideal solution. Strategy maps will show cause and effect ties between different categories and indicators of balanced scorecard. Thus, implementation of financial goals is impossible without improvements and implementation of strategic goals in customer or learning and growth categories. 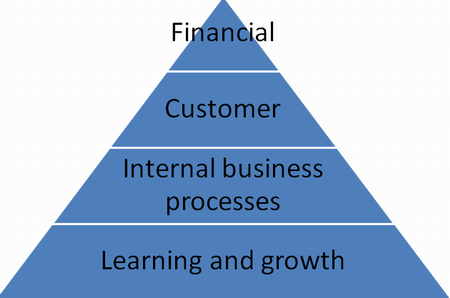 This makes balanced scorecard a unique performance management tool. 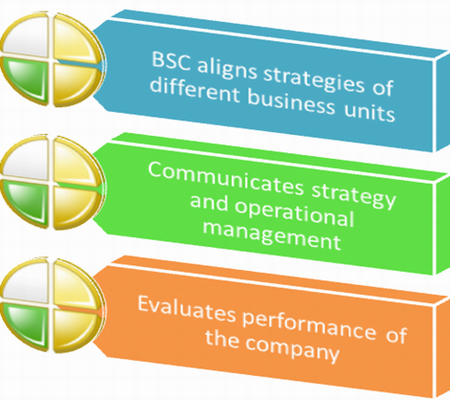 At the same time, balanced scorecard is a great tool for strategic planning. It is important to remember that balanced scorecard is not just and magic management system which all of a sudden solves any business problems. Balanced scorecard will not substitute strategy either. But it will surely help top managers and strategic planners to clearly see what should be done to drive company to its strategic goals. Measurement of business product in a tea will give answers to many questions, including two once concern in implementation of the company strategy.